I adore Instagram. The time I’ve spent scrolling down through hundreds of images could have probably been put to better use, but there’s something both inspiring and relaxing about looking at simple pictures rather than digesting complex words. I follow a huge number of people on the platform (from celebs and ‘mega’ bloggers, to brands and restaurants,) but I’ve picked five of my current favourites to share with you. I follow them all for different reasons, but the one element that joins them all together is their inspirational content and lustworthy images – these are more than just snaps of Starbucks coffees and indulgent selfies. This London-living lady has the life many of us dream of, popping out from her Knightsbridge apartment to grab coffee with friends or shop the latest designer collection. Her photos are inspiring and aspirational without being self-absorbed or snotty (something I find a lot of Instagram users have become!) Her relaxed style, beautiful hair and incredible wardrobe are a constant inspiration and leave me dreaming of winning the lottery. I discovered this super stylish lady during fashion week, but her style is definitely not high fashion – it’s more wearable, relatable and based on classic cuts. She puts her on twist on everything and manages to make even a white shirt look incredible; her wardrobe is full of ladylike dresses that have me drooling, as well as incredible shoes that make me wish I could walk in heels. However, it’s her photos of food, flowers and architecture that get me every time; traveling around sees her posting everything from a Parisian bridge to an overload of ice cream. Definitely one to watch. This cat lady loves her fluffy feline, but equally she’s a big fan of texture. I love the feeling I get from her Instagram account, thanks to the brilliant pics of floors, foliage and food; it’s not all about her, but about what she sees and stumbles across. I do get a little bored of selfies and posed shots, and this provides a refreshing take on snapshots; I adore the rawness Kristina provides. If you like accounts with a theme, then Isabella is definitely keeping to a theme of white. You just have to scroll down to see her obsession with everything clean and fresh, from white flowers and bed linen, to a muted wardrobe and even her super cute white pooch. 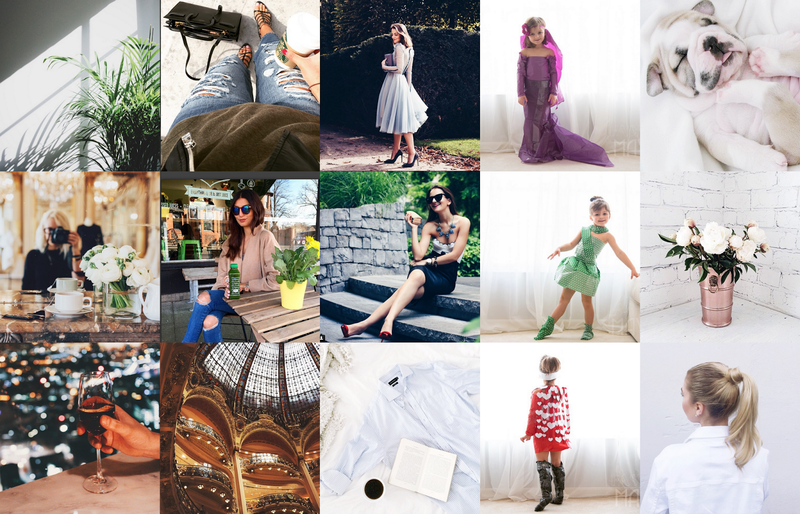 Her life (and Instagram page) is like a Pinterest board – I just want to know how she keeps everything looking so pristine! I’ve definitely saved the best until last, as this is without a doubt the best account I’ve stumbled across. Mayhem is a five year old girl with an passion for fashion: so she creates amazing numbers with nothing more than her stash of paper and sellotape. Almost every day there’s an inspired outfit she’s created with her mum, be it themed around an occasion or simply copied from a favourite celebrity. If there’s one account that makes you believe you can create anything with a little imagination, then it’s this one. Don’t forget you can also follow me on Instagram (@lndnbeautyqueen) for a sneak peek into my daily life, snaps of products before they get to the blog and some of the best food my eyes have seen. Are you an Instagram addict? Do you have any favourite accounts that you think I should check out? SIGN UP TO THE LBQ FORTNIGHTLY NEWSLETTER HERE! BLOG POSTS, NEWS, EXCLUSIVE OFFERS & COMPETITIONS DIRECT TO YOUR INBOX.